All members of the Mt Shasta Goddess Temple are welcome to attend our online Full Moon devotional on April 19 at 8pm Pacific time to participate in our lunar candle-lighting ceremony and drum meditation. The goddess for April in the Temple is Aphrodite, and the animal is Dove. If you’d like to attend this ceremony, please join the Mt Shasta Goddess Temple at any membership level, and further information will be shared with you via our Patreon. All members of the Mt Shasta Goddess Temple are welcome to attend our online Full Moon devotional on May 18 at 8pm Pacific time to participate in our lunar candle-lighting ceremony and drum meditation. The goddess for May in the Temple is Oshun, and the animal is Bee. Wombyn members of the Mt Shasta Goddess Temple are invited to participate in our monthly online Dark Moon Temple, where we learn about the magic of the natal female body, relevant to menstruation, pregnancy, menopause, and similar women’s mysteries. To attend this ceremony, please join the temple and more information about how to participate with follow. All members of the Mt Shasta Goddess Temple are welcome to attend our online Full Moon devotional on June 17 at 8pm Pacific time to participate in our lunar candle-lighting ceremony and drum meditation. The goddess for June in the Temple is the Black Madonna, and the animal is Serpent. All members of the Mt Shasta Goddess Temple are welcome to attend our evening adventure to a local hidden cemetery, where we will have a picnic and commune with the spirits, followed by a moonlit outdoor ceremony. Unfortunately, there is no online option for this event. RSVP required. Priestess Yeshe will be bringing a group of women on an Avalon Adventure to visit sacred sites of the goddess in Britain and attend the Glastonbury Goddess Conference in 2019. This tour is now full. Please look at our other upcoming trips to see if you’d like to join one of our adventures, or Join the Temple to received advance notice of upcoming events and travels. Priestess Yeshe and her husband Albert will be bringing a group of people to attend Hexfest in New Orleans in summer of 2019! Tales of the magic of the Crescent City of New Orleans stretch back over centuries. It is an enigmatic place where Voodoo, Hoodoo, Witchcraft, and even Christianity blend at a crossroads of spiritual power. On August 9th to 11th, 2019, Brian Cain, Christian Day, and the Witches of New Orleans present HexFest: A Weekend of Witchery held in the heart of the historic French Quarter. The conference opens with a Riverboat Ritual and dinner, held on an authentic steamboat on the Mississippi River, followed by two full days of workshops, drumming, and ritual at The Bourbon Orleans Hotel, a venue riddled with a history of hauntings. HexFest has gathered Witches, rootworkers, Voodoo priests and other magical teachers from within New Orleans and around the world to offer their time-honored wisdom. Between workshops, attendees will love the magical shopping in our on-site vending hall where you can purchase powerful ritual tools, signed books, exquisite jewelry, and spellcrafts handmade by true practitioners! Presenters for 2019 hail from across the spectrum of Witchcraft and magic. Our presenters include Brian Cain, Christian Day, Dorothy Morrison, Sorita D'Este, Fiona Horne, Lady Rhea, Sallie Ann Glassman, Hoodoo Sen Moise, Austin Shippey, Starr Casas, Rosemary Ellen Guiley, Byron Ballard, Christine Stephens, Dragon Ritual Drummers, Cairelle Crow, Laura Tempest-Zakroff, Mary-Grace Fahrun, Michael Correll, Mulysa Mayhem, Patricia Telesco, Starr Ravenhawk, Witchdoctor Utu, and Yeshe Matthews! To learn more and sign up for this trip, please contact Yeshe at 510-355-7912. All members of the Mt Shasta Goddess Temple are welcome to attend our online Full Moon devotional on August 15 at 8pm Pacific time to participate in our lunar candle-lighting ceremony and drum meditation. The goddess for August in the Temple is Isis, and the animal is Cow. All members of the Mt Shasta Goddess Temple are welcome to attend our celebration of Magu, primordial creatrix and goddess of hemp, on Sept 21 at 12pm Pacific time. We will be making a CBD salve for healing, chanting Magu’s mantra, and then following up with our online Full Moon devotional at 12pm Pacific time. The goddess for September in the Temple is Magu, and the animal is Egret. RSVP is required. All members of the Mt Shasta Goddess Temple are welcome to attend our online Full Moon devotional on October 13 at 8pm Pacific time to participate in our lunar candle-lighting ceremony and drum meditation. The goddess for October in the Temple is Hekate, and the animal is Wolf. All members of the Mt Shasta Goddess Temple are welcome to attend our online Full Moon devotional on November 12 at 8pm Pacific time to participate in our lunar candle-lighting ceremony and drum meditation. The goddess for November in the Temple is Santa Muerte, and the animal is Owl. All members of the Mt Shasta Goddess Temple are welcome to attend our online Full Moon devotional on December 12 at 8pm Pacific time to participate in our lunar candle-lighting ceremony and drum meditation. The goddess for December in the Temple is the Deer Mother, and the animal is Reindeer. Priestess Yeshe will be bringing a group to Crete and Cyprus in October 2020 to attend the Global Priestess Convocation and to explore sacred sites of the goddesses. Do you hear the call? Contact Yeshe for more information at 510-355-7912. All members of the Mt Shasta Goddess Temple are welcome to attend our online Full Moon devotional on March 21 at 8pm Pacific time to participate in our lunar candle-lighting ceremony and drum meditation. The goddess for March in the Temple is Tara, and the animal is Butterfly. All members of the Mt Shasta Goddess Temple are welcome to attend our online Full Moon devotional on Feb 19 at 7pm Pacific time to participate in our lunar candle-lighting ceremony and drum meditation. The goddess for February in the Temple is Kuan Yin, and the animal is Rabbit. All members of the Mt Shasta Goddess Temple are welcome to attend our online Full Moon devotional on Jan 21 at 8pm Pacific time to participate in our lunar candle-lighting ceremony and drum meditation. The goddess for January in the Temple is Prajnaparamita, and the animal is Spider. Join Members of the Temple online for a ceremony reciting the Heart Sutra and chanting Prajnaparamita to let go of the past and open to the new now. Prajnaparamita is known as the Mother of the Buddhas, the ineffable which has no beginning and no end. Please join the Temple at any membership level to attend this online ceremony. If you are local to Mt Shasta, please join the Temple for details about gathering in person. All members of the Mt Shasta Goddess Temple are welcome to attend our online Full Moon/Solstice devotional on Dec 22 at 8pm Pacific time to participate in our lunar candle-lighting ceremony and drum meditation. The goddess for December in the Temple is the Deer Mother, and we will be working with our ancestors, the spirit of the reindeer, and the spirit of amanita muscaria. 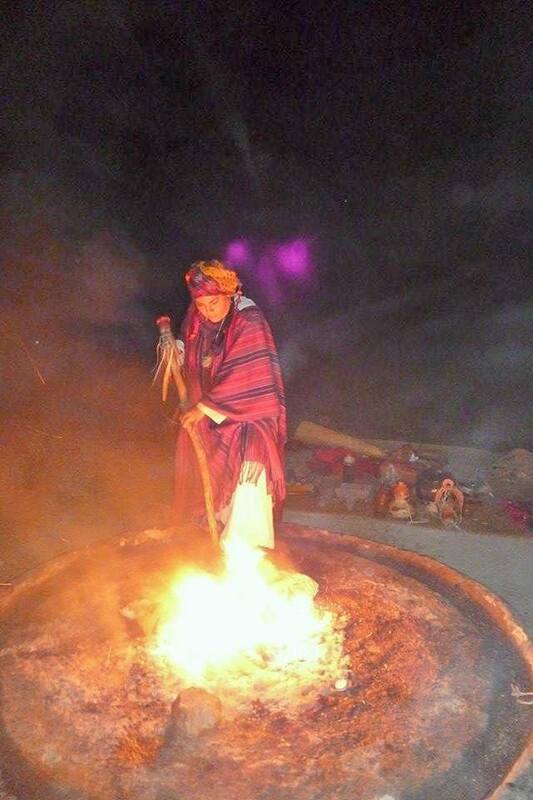 Join us for a very special weekend as we explore ancient Mayan ceremonies, rituals, and traditions with international recognized spiritual leader and teacher Mayan Ajq'iij and spiritual guide Nan Shuni Giron from Guatemala. She will share the ancient Maya wisdom of the sacred used of Cacao and Teonanacatl Medicine of Mesoamerica. This Ancestral Medicine was identified as the food that generates the God Within; the food that connects with your divine innocent inner child. These types of ancient ceremony were used for many healing rituals and many different sacred ceremonies. But mostly, it was used to help people suffering from illness such as depression, fears, confusion, resentment, stress, addictions of all kinds, and other negative behaviors. Come join us for a genuine, unique, and highly transformative ceremony as we come together to work consciously, individually, and collectively allowing ourselves to enter higher realms with the Teonanacatl and Cacao to help heal our hearts and minds at all levels: Physical, spiritual, emotional, mental and energetic. Our weekend together is full of amazing workshops, rituals, ceremonies, and private healing consultations/sessions. You can come to all of our offerings or select the ones that you feel most called to experience. We begin the first 2 hours with Mayan Traditional Fire Ixcacao Ceremony. Then we we will continue with our Teonanacatl ceremony. We will spend the next two hours solo journeying and then two hours together with the group for collective healing. Afterwards we have a pot luck feast together. Each person joining the ceremony will have the opportunity to learn their Mayan birth sign and how to be empowered by it. SPACE IS LIMITED! PLEASE purchase your tickets ASAP to reserve your space. Wombyn members of the Mt Shasta Goddess Temple are invited to participate in our monthly online Red Tent, where we learn about the magic of the female body relevant to menstruation, pregnancy, menopause, and similar women’s mysteries. Priestess Yeshe and her husband Albert are leading an incredible opportunity to visit the sacred sites of the Virgen de Guadalupe, Santissima Muerte, and Aztec goddesses in Mexico City, as well as special Halloween and Dia de los Muertos ceremonies and festivals. We will be viewing the paintings and effects of Frida Kahlo in her home La Casa Azul, visiting the Pyramids of Teotihuacán, and performing rituals for the ancestors on this trip. All members of the Mt Shasta Goddess Temple are welcome to attend our online Full Moon devotional on Oct 23 at 7pm Pacific time to participate in our lunar candle-lighting ceremony and drum meditation. The goddess for October in the Temple is Hekate, and we will be working with our ancestors and the spirit of the wolf. 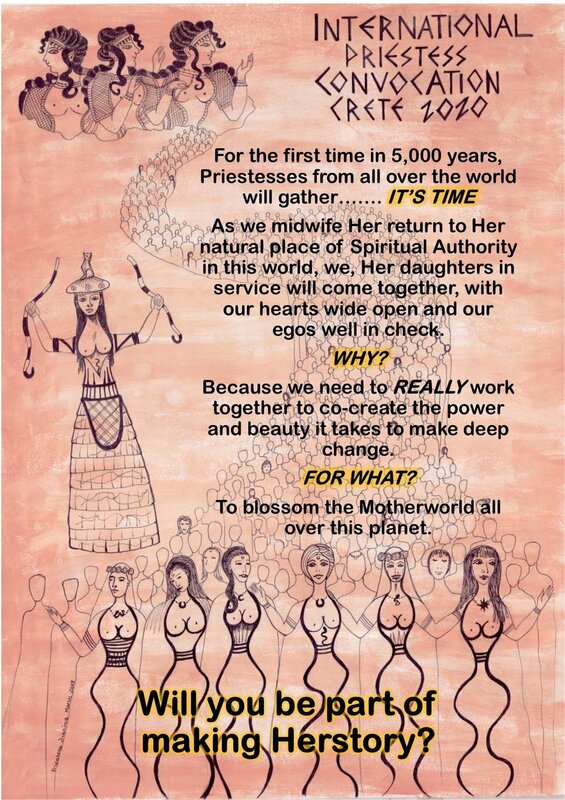 The purpose of this Dreaming circle is to share the vision of the Global Priestess Convocation which will be held in Crete from the 2-9th October 2020. We will explore the vision already held by High Priestess Anique Radiant Heart, who is the presiding High Priestess at the Temple of the Global Goddess in Maitland, Australia. The session will be interactive and an opportunity for you to share your desires for a global gathering of this kind. There will also be the opportunity for you to support the convocation in the way which best suits your circumstances. This is one of many sessions which are being held around the world to support the dreaming and gathering of those devoted to and in service to the Goddess. Come share your ideas, co-create sisterhood, and show your support for the 2020 Priestess Convocation. This event is open to those who intend to go to Crete in 2020 as well as those who are thinking about it, or those who know they cannot go to Crete but wish to build community locally. Born singing, Anique has sung from her heart since she was 3 years old, bringing aunties and grandmothers to tears with her childish yet heart opening renditions of popular songs of the 40’s and 50’s. In her teens, Anique won a national talent quest called OPPORTUNITY KNOCKS and went on to sing on programs like BANDSTAND and SATURDAY DATE. She then went on to become an award winning jazz diva, and continued to sing professionally until her 50th birthday. It was then that she dedicated her life to singing devotional music. Having never been taught music in any form, Anique did not consider herself a songwriter, but when she began, during meditation, to receive transmissions in the form of beautiful songs and chants celebrating the Goddess, she decided that these expressions of Divinity were meant to be heard by all who love the Divine Feminine. Her warm stage presence, superb voice and technical expertise ensure that her audiences are satisfied at every level. She oozes a genuine love of life and is so confident in her delivery, that one feels they are in the presence of a world class performer. All are welcome to come to The Sacred Well, 325 Lawndale Court in McCloud, on Oct 4 at 5pm for our monthly change of altar. We will be taking down the September altar to Maiden Magu, and putting up our October altar to Hekate. You are welcome to bring things to place upon this altar, including items related to dogs, horses, snakes, keys, pomegranates, and lanterns. During the altar building we will bless several skeleton keys for attendees who want them (these are $3 apiece). If the Autumn chill in the air and the recent rains have you feeling extra witchy, you are encouraged to dress in black or red and wear your finery to this event, which is free of charge. For Autumn Equinox, members of the Mt Shasta Goddess Temple, the Sisters of the Sacred Mountain, Creativity and the Divine Feminine, the Goddess Temple of Ashland, Circle of Dawn from Maryland, and Priestesses of Amana and the Temple of Donto-In from Japan will be gathering to perform an Autumn Equinox Ceremony to balance and harmonize the elements. We will convene at the headwaters of the Sacramento River in Mt Shasta City Park on Sunday, Sept 23 at 2pm. It is free to attend this circle. Please bring rattles or shakers, plus any sacred water or rainwater you might have, to participate in this ceremony. On this day of balance between light and dark, we will honor the spirits of the land, the ancestors of Mt Shasta and all of our lineages, and the Earth herself in a ritual asking that the elements of earth, air, fire, and water come into harmony and that all beings assist and support planetary wellness. For more information, please text or call 510-355-7912. 50,000th Kuan Yin mantra recitation! Since August 2016, Priestess Yeshe has been offering daily Kuan Yin chanting practice via Facebook ever Monday-Friday. The brief, simple practice has two goals: 1) to accumulate 100,000 mantra recitations of “Namo Kuan Shih Yin Pusa” and “Om Mani Padme Hum” and 2) to generate energy for the installation of a shrine to Kuan Yin with 1000 statues in Mt Shasta. On Friday, Sept 21, Yeshe and the Skydancer Sangha will cross the halfway mark of the practice with 50,000 mantra recitations! If you have been following along, or even if you are new to the practice, please tune in at 8:30am to Yeshe’s Facebook account, and be there for the 50,000th mantra recitation! May this small act be of benefit to all beings.